At a time when the draped, columnar and classically-inspired dress came into fashion, photography would also follow a neoclassical aesthetic. A major proponent of this photographic style was George Hoyningen-Huené, who often inserted Greek-like columns and classical architectural elements into his mise-en-scène. Hoyningen-Huené is most known for his images which featured models posed stoically in bathing suits, celebrating the athletic body and alluding to classical sculpture. 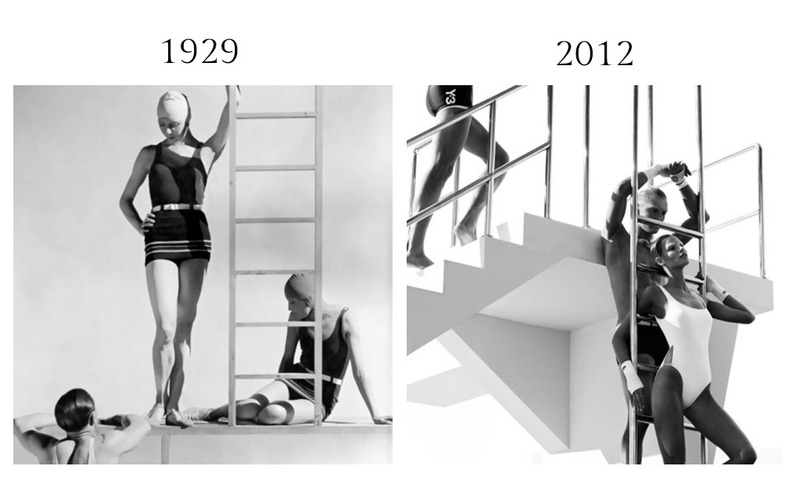 The Russian-born photographer’s most well-known 1929 photograph undoubtedly inspired Mikael Jansson’s 2012 editorial “Olympiad” for Interview Magazine’s May 2012 issue.